I have discovered what is quite possibly the ultimate breakfast and snack recipe. The same basic, 10 minute recipe can either be chilled and crumbled over unpasteurised yoghurt or almond milk as a beautiful raw granola, or it can be rolled into bite sized spheres to create the most blissful of bliss balls for snacking. And no, there is genuinely no way yet discovered by man to photograph bliss balls without making them look like poop. My apologies. Anyway, this recipe is loaded with good, natural fats from the activated nuts, seeds, and coconut oil, and an extra protein kick from the optional addition of Sun Warrior protein powder - the ONLY protein powder I touch as it is made from sprouted brown rice and stevia and contains no denatured and unhealthy ingredients. This recipe contains lots of bioavailable calcium and magnesium in the form of activated almonds and raw cacao. Calcium is so important that the body will leach it from the bones and teeth in order to maintain optimal blood Ca+ levels if dietary intake is inadequate. Magnesium is especially important for muscle relaxation and is great for the ladies and gents who train hard or suffer from any niggling aches and pains. There are loads of antioxidants in this dish too, mainly from the raw cacao, goji berries, maca powder, and chia seeds. We've also got some good carbohydrates from the dates, with an impressive enough mineral profile (and not to mention the fact that it is paired with plenty of protein and fat) to keep this breakfast low GI and not drastically spike blood sugar levels first thing in the morning. 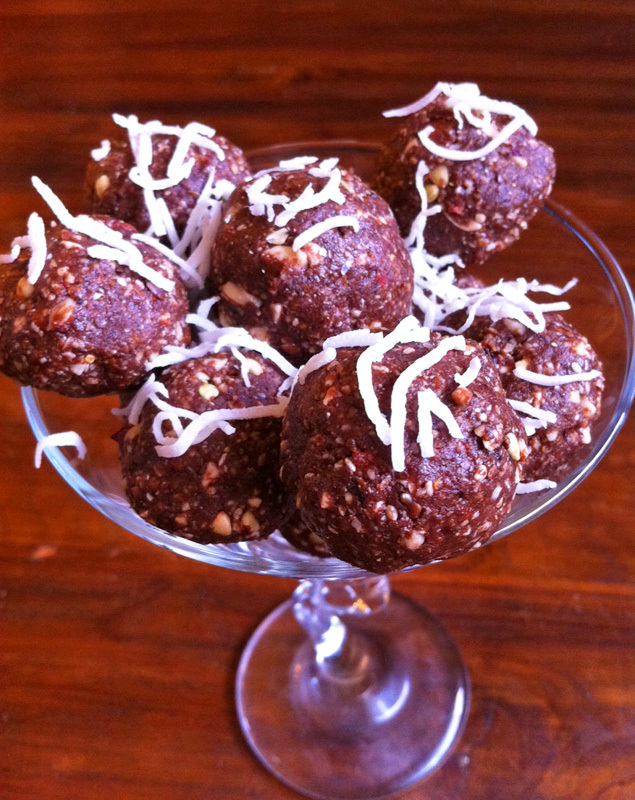 This recipe is grain-free, gluten-free, dairy-free, sugar-free, raw, and vegan. I tend to serve my granola crumbled over some Alpine unpasteurised goat's milk yoghurt with a handful of fresh blueberries, but to keep the recipe vegan it could easily be crumbled into some almond milk instead of the yoghurt. For optimal nutritional and probiotic profile, I would always recommend the yoghurt. All you will need for this recipe is a food processor, a coffee grinder (optional) and a small slice pan. Process all ingredients except for the activated buckwheat and raw cacao nibs in your food processor until it starts to come together. Then, stir in the buckwheat and cacao nibs and either press the mixture into a baking tray lined with cling-film for the granola, or roll into bite-sized balls for a snack! Keep refrigerated and simply crumble the granola over yoghurt, milk, pancakes, or fruit salad when you are ready to eat it! The activated buckwheat and raw cacao nibs add crunch to this meal, but please omit the cacao nibs if you plan on eating this for dessert and are sensitive to caffeine, as they are quite high in it.